Accent lamps complement the décor of any room. Choose from a variety of wholesale lighting collections and themes including coastal, cottage, country, contemporary, Euro-style lamps and more. 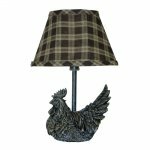 Our bird and rooster lamps are some of our best-selling categories. With over 50 accent lamps from which to choose, you'll be able to fill your store with a lighting assortment that pleases your customers.